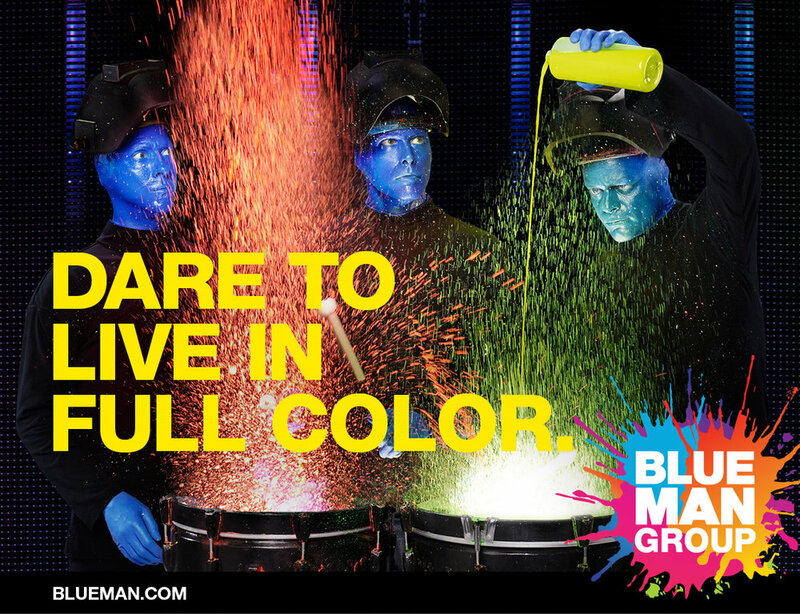 After 25 years since it started, the theatrical troupe that is the Blue Man Group decided it needed a more youthful, bold rebranding. Our new campaign, "Dare to Live in Full Color," challenges our audience to reconnect with their inner child and find their creativity and fearlessness once more. We created videos, OOH, print ads, and a Tumblr page encouraging users to share their most "full color" moments. The Blue Man logo also received a more energetic treatment; it now includes colorful paint splashes behind the wordmark, alluding to the paint used throughout the show. Leading up to New Year's Eve, we displayed a message right below the ball drop in Times Square encouraging people to send a text to a number to receive a special Blue Man Group video on how to recover after the night's celebrations. This was also shared on BMG's social channels.